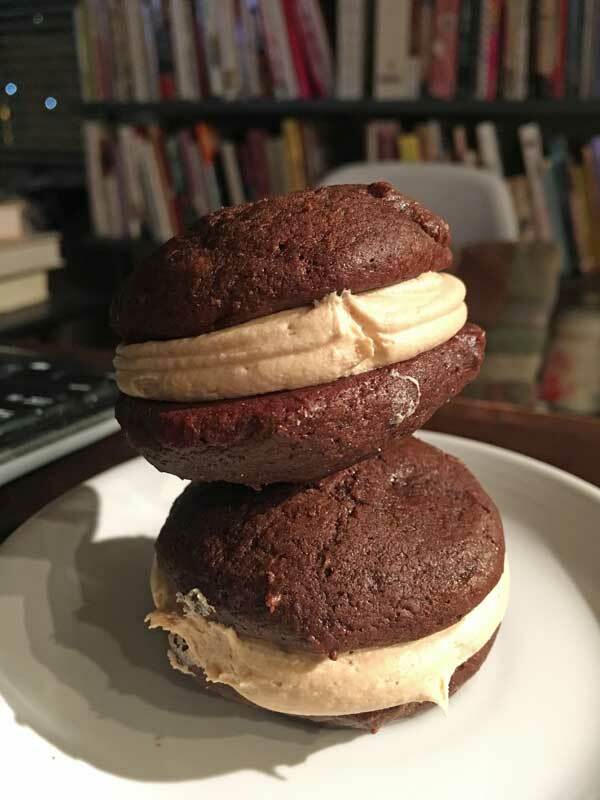 My usual Chocolate Whoopie Pies get the best reviews, and because of that I tend to use the recipe over and over. 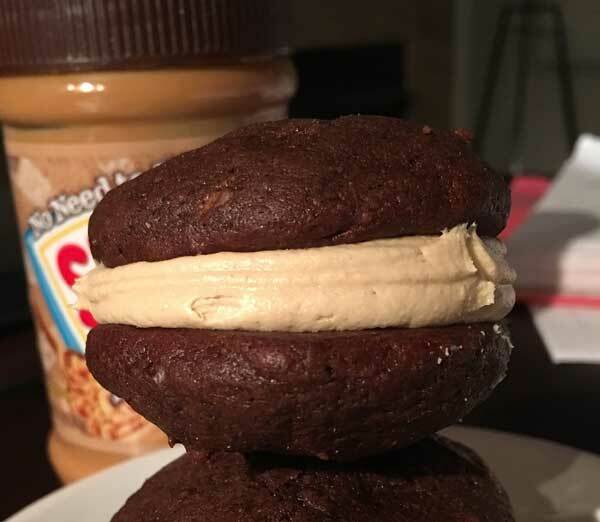 However, this week I decided to experiment and came up with these Peanut Butter Whoopie Pies. I made them by modifying the usual recipe and adding peanut butter to the filling. The first changes I made were to the cake part of the cookie. My usual recipe calls for buttermilk and natural cocoa powder, but I since I don’t always have those two things on hand I tried a combination of Dutch cocoa powder and regular milk. That version was okay, but in a side-by-side taste test the buttermilk and natural cocoa version won out, so I’m sticking with my usual recipe for the cake component. In addition to confirming that I don’t need to look for a new “cake” component, I discovered that piping the filling into the center of the cookies is a much better way to go in terms of both efficiency and neatness. It’s definitely worth breaking out the pastry bag in this case. For the tip, I use a 1/2 inch round. However, even a pastry bag without a tip or a snipped-corner heavy duty zipper bag works just fine. 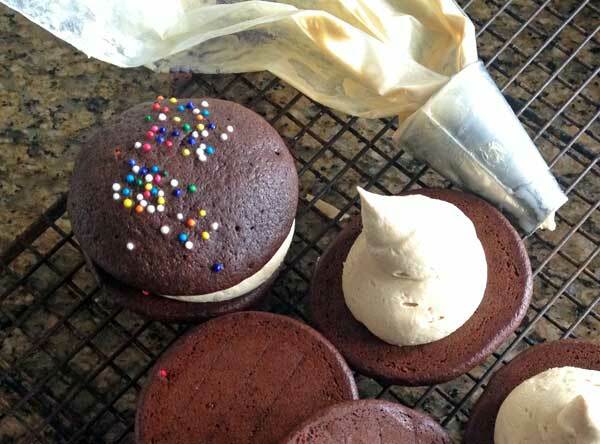 The Irish Cream flavor comes through in these popular Chocolate Whoopie Pies. The cookies are puffier and lighter when made with a mixture of shortening and butter, but all-butter works too. The filling holds up better when a bit of shortening is added, but again -- you can skip it and use butter in its place. Preheat oven to 350 degrees F. Line two baking sheets with nonstick foil. Thoroughly mix together flour, salt, baking powder, baking soda, and cocoa powder. Using an electric mixer, beat the butter and sugar until creamy, then beat in the vanilla. Add the egg and beat until fluffy, scraping sides of bowl often. Add the flour mixture and milk alternately, stirring with a heavy duty scraper, until batter is smooth and thick. Drop batter by generously heaping tablespoons onto baking sheets spacing about 2 inches apart. Alternatively, transfer the batter to a pastry bag or heavy duty freezer bag with the corner snipped off and pipe gobs of batter onto the sheet. Bake one sheet at a time for about 12 minutes or until cookies are puffed, slightly cracked and set. Let cool on baking sheets for about five minutes, then carefully transfer to a wire rack. Filling: Beat the butter, peanut butter and sugar together until creamy. Beat in vanilla and marshmallow cream until smooth. Taste test. Add more peanut butter if desired. Fill the sandwich cookies by spreading between cookies or piping it in. Piping the cream in is an extra step, but it makes the process of filling go smoothly and the pies look better. If you don't have the buttermilk and want to use Dutch process cocoa powder, make the following changes: Use 1/2 teaspoon of baking soda and 1 teaspoon of baking powder, 3/4 cup Dutch process cocoa powder and 1 cup of whole milk. 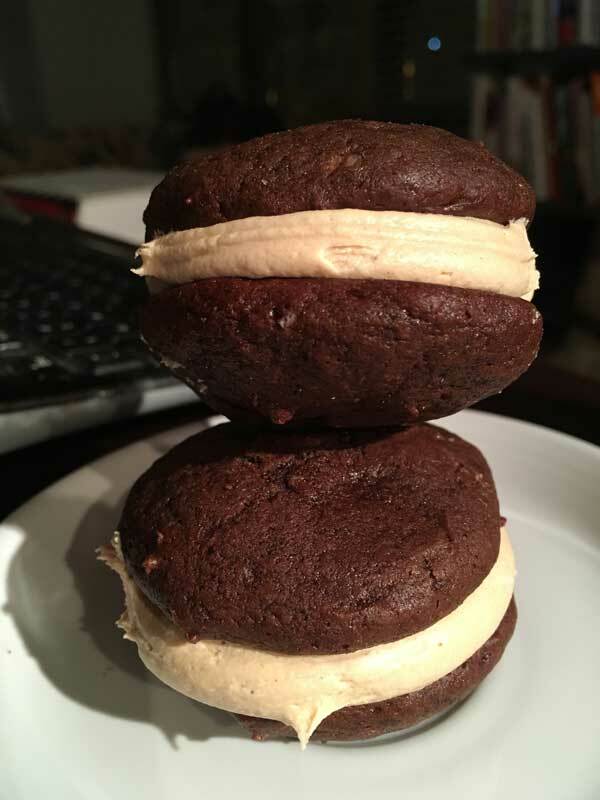 Love whoopie pies! What a delish idea to incorporate peanut butter into them! I’m so glad that you posted this! I have a recipe for peanut butterpastry cream that I love, but I’m not really an eclair person, so I will try it with my whoopee pie recipe next time!